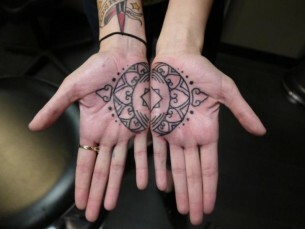 Palm tattoos are a modern, fresh and fashionable trend in the tattoo art. The tradition to cover palms of hands with drawings came from India. This is a country where people have a magical habit of painting their hands with henna before different celebrations or weddings. 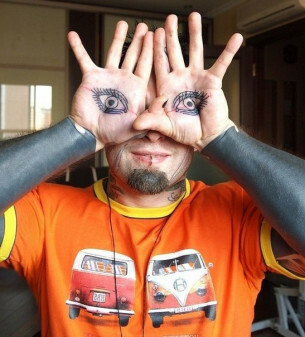 However, these ornamental body art stays not for a long period, they get pale and destroyed the very next day after they’ve been made. 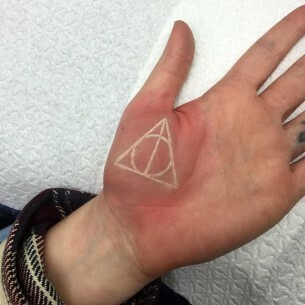 The process of making tattoos on a hand, palm or its side is rather painless, as the skin here is quite thick. The size and shape of a palm are not very big, so only small writings, letterings and simple small drawings are good here. Eastern ornaments look the best on palms, they do not provoke a cognitive dissonance as they look authentically and traditionally. These are designs of sophisticated lines, which make it seem that there is a lacy glove put on a hand. The Buddhism followers make mandala palm tattoos – the circular ornament, the symbolical picture of the Universe. For those, who want to show their original way of thinking the symmetrical tattoos on left and right pals would be perfect, and they make them. The most common ones are drawings of spider-web or eyeballs. 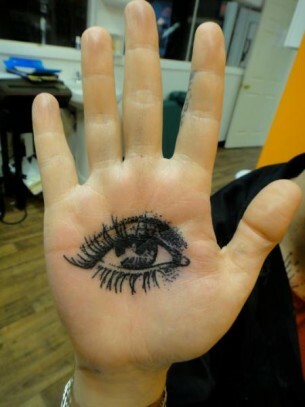 Another variant of eye palm tattoo is the Hamsa. This is a great charm of Arabian and Jewish cultures and traditions. It is very powerful and capable of helping its owner to protect himself from jinx, evil eyes and curse. Matching tattoos on sides of palms also look marvelous. In this case, some special tattoo ideas are picked or specially created for the particular person. For example, these can be wings of a butterfly or a pack of flying birds. The tattoos are placed in a special way, in order to it to be possible to imitate the motion of the wings of a butterfly moving your hands accordingly. Another trend is formed of tattoos of different letterings of different kinds. This could be famous quotations, extracts from prayers, names of beloved and relatives etc. In spite of the popularity, a palm is one of the most unsuitable placements for a tattoo, The skin here is proved to refresh very quickly, so any drawing placed here soon becomes vague and looses its original beauty and then disappears completely, if not refreshed with a new session. That’s why mainly minimalistic, simple or even primitive designs consisting of lines and vivid geometrical figures are chosen to be placed here. And all palm tattoos look exquisite if their owner has really feminine, thin and tender hands with long fingers.